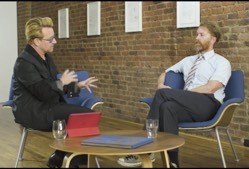 In a recent video series with David Taylor, a theology and culture professor at Fuller Theological Seminary in Pasadena, California, the Irish rocker was asked to identify the one thing he's learned about God while reading the Psalms. When asked what he learned about himself through the Psalms, the "Vertigo" singer admitted, "I don't listen enough." He added that the most "troubling and difficult" thing the Psalms required of him was "honesty." 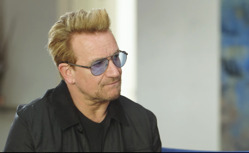 Bono further discussed the importance of listening in the fourth installment with Taylor, encouraging pastors to "look for the drawing in the sand," referring to John 8:1-11. "I don't know why we don't know what Jesus wrote in the sand. It's telling that we don't know. The privacy of that moment is sort of rich. In a world where there is no privacy, that's a rich moment." The singer also said that he believes all art is by nature "prophetic," and "if the job of the prophet is to describe the state of the soul, the soul of the city, if we want to know what's really going on ... you've got to really go look at the art."